The days of inkwells and dip pens are long gone, but the romance of writing with them lives on in this pastel nail manicure you can do at home. To create this feathered design, apply three different alcohol inks and a white base coat. The translucent colors apply like water and give the design an abstract look. 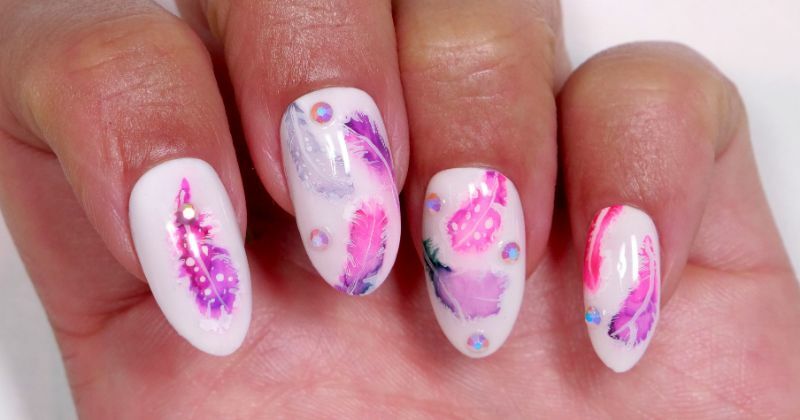 Once you've achieved a color combination you like, outline the feathers and add an iridescent rhinestone. If you don't own feather pen nibs, you can find them inexpensively online. 3. Pour isopropyl alcohol into a glass dish, then apply a drop of each color of alcohol ink onto a pad of Extreme Post-it notes. 4. Dip the fine detail brush into the alcohol, then wipe the brush tip on the Post-it note. 5. Dip the brush tip into the purple ink, then drag the bristles against the Post-it note once more to wipe off the excess ink. 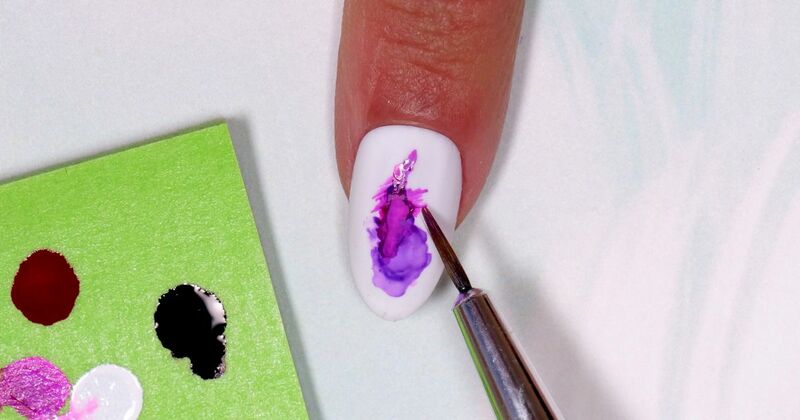 Create a circle with the purple ink on the nail. 6. Wipe the brush on the Post-it note to clean it off, then create pink ink by dipping the bristles into the magenta ink and then into the white. Swirl those two colors together on a clean spot on the pad, then apply the color to the nail. The two colors should overlap slightly and form an abstract feather shape. 7. If the colors aren't dark enough, dip the brush in the alcohol again, and add more color. If you want to make the color sheerer, dip the brush in the alcohol and thin out the existing ink. 8. When you’re happy with the color, cure the ink with the lamp, then apply a layer of matte no-wipe gel top coat and cure again. 9. To add dimension to the feather, apply one drop of white alcohol ink to a clean Post-it note. Dip the feather pen nib in the ink, then draw the center vein and outer edges of the feather. Add a few dots to the center, too. 10. Apply a layer of no-wipe gel top coat, but do not cure it immediately. 11. Use a rhinestone picker pencil to place a circular iridescent rhinestone onto the wet gel, then cure the gel with the lamp.